Nicky Brett receives the Players Player of the Year award. Local bowler Nicky Brett collected two awards at the World Bowls Tour Awards Night held at the Potters Resort at the weekend. The world number one was named ‘Player of the Year’ and ‘Players’ Player of the Year’ at a ceremony that acts as the curtain-raiser to the World indoor championships. However, a few hours later there was little to celebrate as Brett and long-time pairs partner Greg Harlow were beaten in the quarter-finals of the world pairs by the strong Scottish pairing of Stewart Anderson and Darren Burnett, both recent world singles champions. Bidding to regain the title they won two years ago, Brett and Harlow were soon on the back foot in the opening set which they lost 7-12, but forced the pace in the second, opening up a 6-0 lead which they duly protected to win 10-6 and force the match into a tie-break. The Scots took the opening end, Harlow drew the shot on the second to square matters, but missed with his running bowl on the next and so the Scots moved through to the semi-finals. Brett will be seeking better fortune when he begins his singles campaign next Monday against England qualifier James Rippey. The hopes Northants Bowling Federation had of winning a third Derbyshire Trophy indoor inter-county championship received a setback on Sunday when they were beaten 74-106 by Lincs at Lincoln IBC. Having won the outdoor equivalent, the Adams Trophy, at Skegness in August, the county were hoping they could achieve a notable double, but Lincs proved too strong on the day, leaving Northants with just two points for their efforts. It means that maximum points against North Cambs at Peterborough & District on Sunday week is essential if they are to keep their hopes alive. They finish the campaign away to Norfolk in early March. Lincs mastered the quick conditions much better on the day and won convincingly on three of the four rinks. Outstanding for Northants was Tristan Morton who showed time and again why he is much in demand as a skip with touch in his drawing shots and power and accuracy in his drives. He was supported by Brian Martin and county president Bob Warters, one of three enforced changes from the team that defeated Hunts in the opening fixture, in a 30-18 win, the margin of which probably flattered them thanks to 10 shots achieved in the last three ends with the overall match already beyond Northants’ reach. 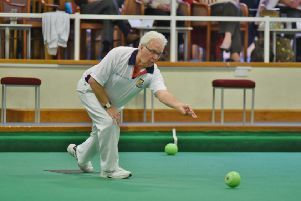 Elsewhere, Simon Law’s rink never got to terms with their opponents after trailing 1-12 after seven ends, while Jon Earl’s trio held a slender lead until opposite number George Draper switched to number two and proceeded to inspire a runaway 25-13 win. Team captain James Harford kept his trio in touch for long periods against the equally talented Jonathan West, but 11 shots without reply on the last six ends put the match beyond them at 15-30. John Holroyd, Neil Wright, Simon Law lost 15-33. Stephen Harris, Paul Dalliday, Jonathan Earl lost 13-25. Howard Shipp, Nick Wilkie, James Harford lost 15-30. Brian Martin, Bob Warters, Tristan Morton won 30-18. The Peterborough women’s team are through to the last 16 of the Yetton Plate, the consolation competition for clubs beaten in the opening round of the mainstream Yetton Trophy inter-club championship. They defeated Daventry 93-62 and now face either Swindon Manor or Avon Valley on January 30 for a place in the quarter-finals. Having helped England win the British Isles title for a seventh year in a row last season, city bowler Catherine Popple, who plays indoors at the City of Ely club, finds herself among the three travelling reserves for the series at Llanelli in March. Although clearly the dominant force in this event, the selectors have decided to make several changes and include a number of new caps, including Spalding’s Rebecca Simpson, who joins club-mate Annalisa Dunham in the team. The annual meeting of Huntingdonshire Bowls takes place at Sawtry BC tomorrow (Friday) at 7.30pm when the county will appoint a chairperson for the first time.